This will be the 19th Carson Lecture. The series as created in 1996 with a bequest from the late Ruth Carson to provide opportunities to encourage the spiritual growth of Highland’s congregation. Many members of Mrs. Carson’s family, including her granddaughter, Sara Royer and several great-grandchildren, are still active members at Highland. Brian K. Blount is President and Professor of New Testament at Union Presbyterian Seminary, Richmond, VA and Charlotte, NC. He was called to this position in 2007, after serving for 15 years as the Richard J. Dearborn Professor of New Testament Interpretation at Princeton Theological Seminary. An M.Div. graduate of Princeton Seminary in 1981, he obtained his B.A. from the College of William and Mary in 1978. After graduating from Princeton Seminary, he went on to become the pastor of the Carver Memorial Presbyterian Church in Newport News, Virginia from 1982-1988. 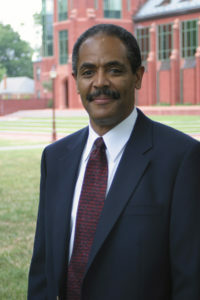 William and Mary’s first African-American to receive membership in the Alpha Chapter of the Phi Beta Kappa Honor Society received his Ph.D. in New Testament Studies from Emory University in 1992. He returned to teach at Princeton Seminary the same year. In 2016, he was elected vice president of the Society of Biblical Literature. After serving in that role for one year, he assumed the presidency of SBL in 2017. In 2016, he was also elected to serve as vice president of the Association of Theological Schools. In 2018, he assumed the role of president of ATS. Professor Blount’s primary work has been in the Gospel of Mark, the Book of Revelation and in the area of cultural studies and hermeneutics. He is the sole author of six books: Cultural Interpretation: Reorienting New Testament Criticism (Fortress, 1995), Go Preach! Mark’s Kingdom Message and the Black Church Today (Orbis, 1998), Then The Whisper Put on Flesh: New Testament Ethics in an African American Context (Abingdon 2001), Can I Get A Witness? Reading Revelation Through an African American Lens (Westminster John Knox Press, 2005), Revelation. A Commentary in the New Testament Library Series (Westminster John Knox Press, 2009), Invasion of the Dead. Preaching Resurrection (Westminster John Knox Press, 2014). In 2010, his Revelation commentary was voted the 2009 top reference work by the Academy of Parish Clergy. He has also edited a volume of essays on worship with Leonora Tubbs Tisdale entitled Making Room at the Table: An Invitation to Multicultural Worship (WJK, 2000). He is also the coauthor of a book with Old Testament scholar Walter Brueggemann and theologian William C. Placher entitled Struggling With Scripture (WJK, 2001). He has also co-authored the book Preaching The Gospel of Mark in Two Voices (WJK, 2002) with Gary W. Charles, the pastor of Cove Presbyterian Church in Cove, VA. He is an editor of The Discipleship Study Bible, also by Westminster John Knox (2008). As a part of his work for the Bible, he has written the introduction and notes for Mark and Matthew. He is an associate editor of the New Interpreter’s Dictionary of the Bible for Abingdon Press. He is the General Editor for True To Our Native Land: An African American New Testament Commentary by Fortress Press. He is also an editor for the forthcoming revised Interpretation commentary series by Westminster John Knox Press. He lectures widely. He was the 2011 Beecher Lecturer at the Yale Divinity School, Yale University. The author of numerous articles, he also preaches and directs adult education classes in local congregations. He is married, and he and his wife, Sharon, have two children, Joshua and Kaylin.